Hi friends! My name is Amber and I am so excited and honored to be a guest today! I'm a Registered Nurse by day, but I'm a Scrapbooker just about every other moment. 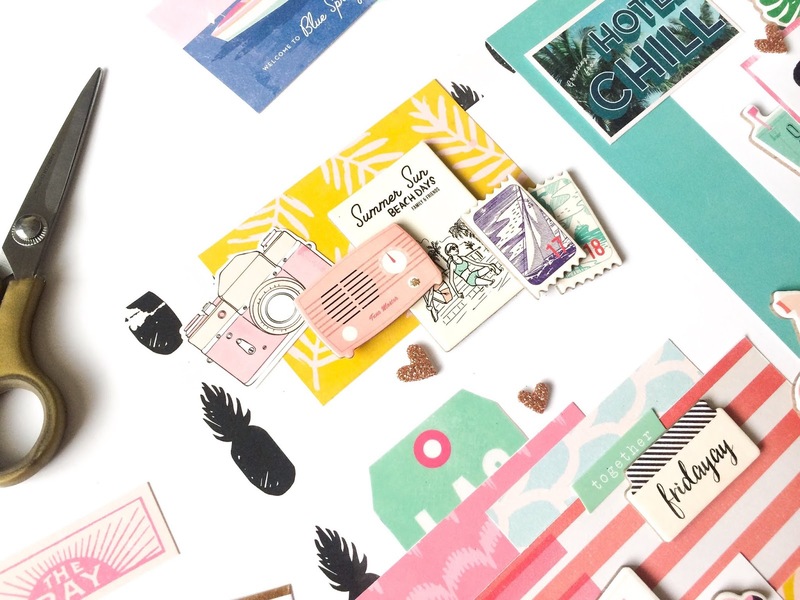 I love scrapbooking and paper crafting, and I run my own Scrapbooking blog called Aspire by Grace. 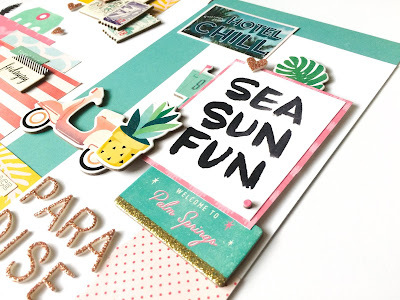 I absolutely love this month's creative challenge interpretation and had so much fun creating this layout. 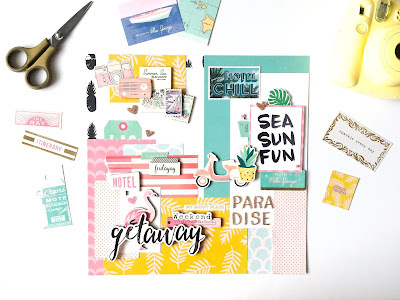 I don't know about you, but when creating scrapbook layouts, I tend to gravitate toward the same group of compositions. When a good thing works, you work it hard am I right!? 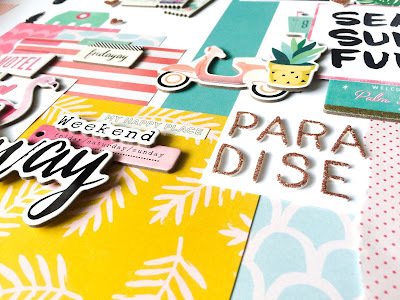 That being said, I do like to save scrapbook layout inspiration to give me fresh ideas on different layout styles. It's nice to switch things up every once in a while! Pinterest is a great resource for saving scrapbook layout ideas. I have a board specifically for scrapbook layouts where I can pin various layout styles and techniques I want to try! I was so excited when Florencia reached out to me and asked me to participate in this creative challenge. The challenge was to create a layout inspired by a mood board of my choice. Well, I absolutely love mood boards so I instantly got excited and inspired by the concept. I am always up for a creative challenge! I hopped right onto Pinterest and began searching for pretty mood boards. I tend to lean toward more vibrant, colorful, feminine, and encouraging boards to keep my creativity fired up. 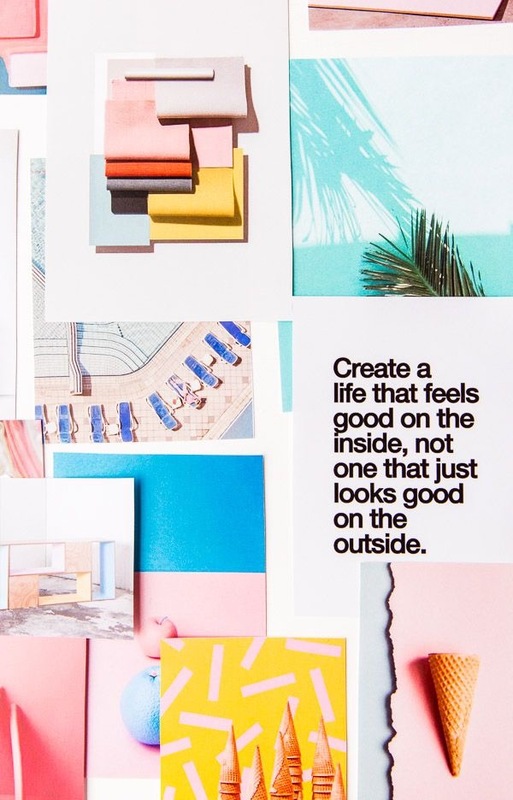 It didn't take long at all for me to find this colorful mood board with an inspiring quote. With this particular mood board, there were a lot of pieces layered on top of each other. The pieces were also mostly square/rectangle shaped. To stay true to the mood board design, I cut paper in sizes and shapes to match the picture. I also chose my papers based on their colors. Again, I tried to pick papers that matched the colors of the mood board. The colors of the mood board were very bright and summery. And even though we are now well into Fall, I just loved the vibe and decided to run with it. When picking my ephemera, stickers, and other embellishments, I tried to use items that fit the summery vibe and theme. I started by arranging my several pieces on a 12x12 paper. I tried to arrange and layer the composition of my pieces according to the mood board picture. Then, I stuck everything down using adhesive tape. Now I had a colorful "board" with all of my layers ready for embellishing! I decided to use a lot of chipboard stickers to embellish my layout. This really helped add texture, dimension, and personality which made it appear more like a physical mood board. When looking at the mood board picture, you can see in the upper left corner there's a cluster of different colored fabric swatches. Well, I didn't quite have any fabric swatches handy. So instead, I decided to use some different colored summery chipboard stickers from the Crate Paper Oasis collection. I combined these stickers into a cluster in the upper left corner to give a similar appearance. On the middle right edge of the mood board, you can see there's a white paper with a quote in black text. Right above it is a pretty blue colored picture with some kind of plant tucking out from underneath. I found a white phrase card with black text from the Oasis collection and decided to place it in the same spot. Again, I went for the Oasis chipboard stickers and tucked a tropical leaf underneath the top of the phrase card! Toward the bottom right corner, you can see a pink paper with a torn edge. I decided to tear the edge of the paper I placed in that spot to give the same effect. And finally, the cluster of papers to the bottom left corner contains different shades of pinks, blues, and yellow. I chose papers of the same color scheme and arranged them according to the mood board picture. Of course, I had to add my own flair and touch to the layout to make it mine. I used more chipboard pieces and stickers to contribute to the overall summery theme of the mood board. 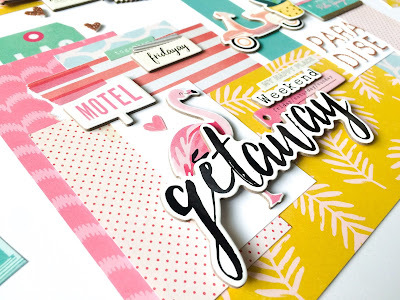 That pretty flamingo and "weekend getaway" phrase are some of my favorite pieces! I also added some rose gold alphabet thickers from Crate Paper's Wild Heart collection. to spell out "paradise." Touches like this fit perfectly with the overall theme of the mood board. The idea behind this concept is to find creative inspiration and challenge yourself to compose your layout in a different design. 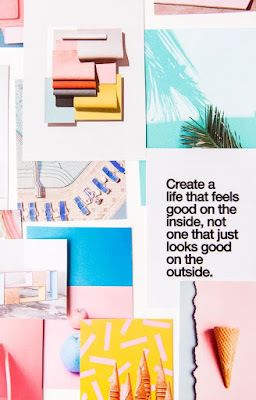 Let yourself get inspired by the vibe, the theme, the colors, the shapes, the textures, and the overall layout of the mood board. Then make it your own! Use these new concepts and ideas to create something that is yours in the end. Don't forget to add your own flair and personality! I hope you are as inspired and challenged as I was by this mood board concept! There are so many different mood boards out there. 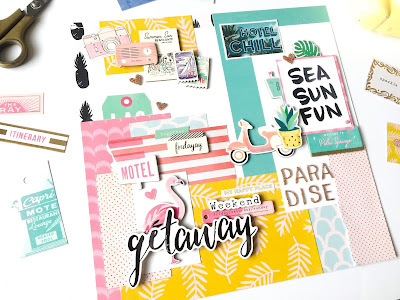 You'll never run out of scrapbook layout inspiration if you're ever wanting to try a new composition or style! 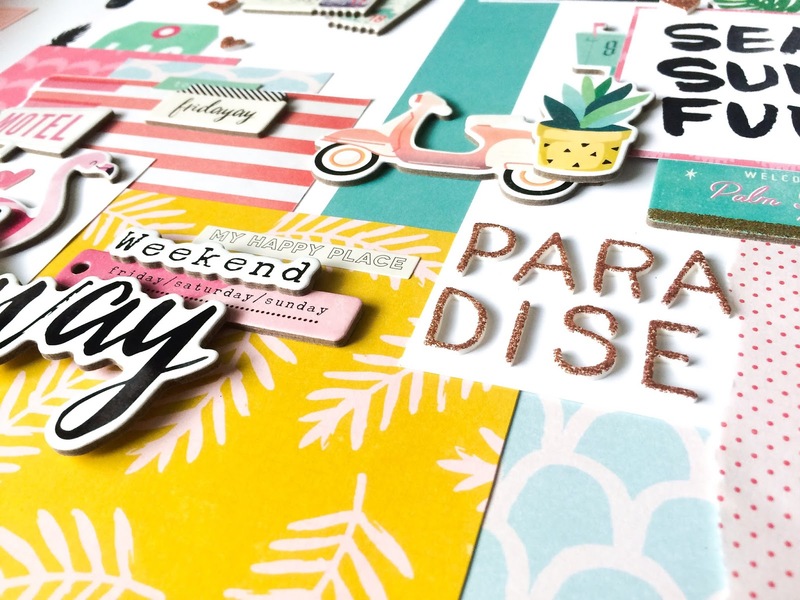 I had so much fun creating this layout, and I'm so honored I got to be a part of this challenge.